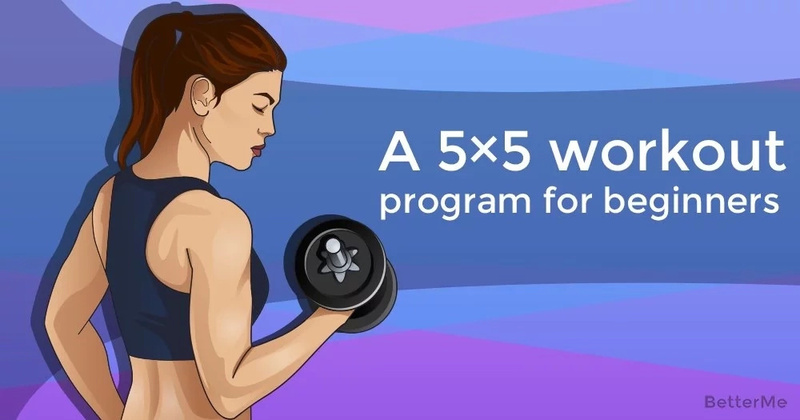 Today, we would like to present you with a 5×5 workout program for beginners. This workout will help you change your fitness life. Also, by adding the 5×5 workout to your life, you can easily build muscles, gain strength and get ripped. This killer workout includes five exercises such as the Squat, Bench Press, Deadlift, Overhead Press, and Barbell Row. You need to perform this 5×5 workout program three times a week. Each workout, you will do three barbell exercises for sets of five reps. The goal of the 5×5 workout program for beginners is to increase the weight. You will gradually increase the weight by adding 2,5kg/5lb each workout. This gradual increase of weight will help your body to get stronger and build muscle. What’s more, if you want to achieve good results in building your body, you need to stick to a healthy diet. You need to consume foods such as red meat (beef, pork, lamb, deer, buffalo), poultry (chicken, turkey, duck), fish (tuna, salmon, sardines, mackerel), eggs, and dairy (milk, cheese, cottage cheese, quark, yogurt). Try to eat every 3 hours. Do not forget to drink enough water daily! Also, if you want to speed up your results, you should add some cardio to your workout plan. We recommend you find the right kind of cardio and perform it with joy. Cycling, walking, running, and dancing are suitable options for cardio. You must perform cardio sessions for at least 30 minutes a day. Scroll down to see how perform this 5×5 workout program.